Home GPS2Blue MapCapt Labo Vin AutoUSBCheck TenClips Tortoise Com. This GPS-PDA utility has several features. It transforms your PocketPC into an external bluetooth GPS receiver, allowing you to use it with your laptop PC or any other device which can use a bluetooth GPS. Since version 1.4, GPS2Blue also allows to redirect GPS data to a TCP/IP port. It can also log to a file the data received from the GPS. 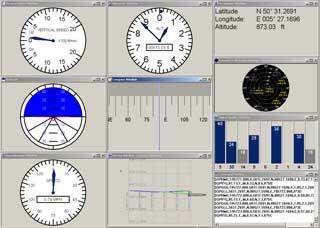 Another feature is the PDA clock adjustment based on the precise GPS satellites clock. Finally, for Tomtom 5 (or 6) users, you can create a new POI from coordinates. I've written GPS2Blue for my own use. It is firstly inspired from GPSRedirect... It can be freely downloaded and used, at your own risk, I don't make any support. Microsoft .Net Compact Framework 2 must be installed (note: Microsoft releases .NET Compact Framework 2.0 Service Pack 2 which can be easily installed on storage card...). Enter the coordinates, they appear in the POI list. Add your POI when Tomtom is not running. 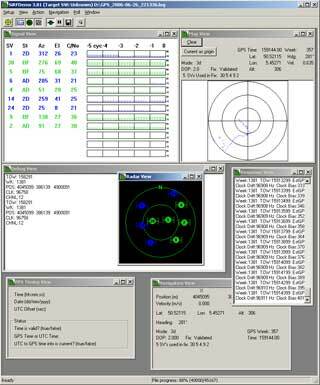 Works in NMEA, Raw and SiRF mode. Compatibility with GPS intermediate driver; background recording (i.e. : log data while another GPS application is running or works standalone). Display GPS status if GID used. On the fly compression of the log files. Record position, speed, altitude... Use GPS2Blue as a black-box of your Tomtom (and others) trips. Option to turn off PDA's powersaving. via bluetooth (for bluetooth PDA). via TCP/IP (TCP/IP over USB, GPRS or WiFi). You can create, on your PC, virtual COM ports from TCP/IP with HW VSP. Enjoy your GPS on a big screen. Compatibility with GPS intermediate driver (i.e. : redirect while another GPS application is running or works standalone). Bidirectional (you can for example configure your SiRF based GPS PDA with SiRFDemo directly from your laptop/desktop PC). VisualGPS (NMEA mode) on a laptop using the PDA as receiver. Configure and analyse your PDA GPS with SiRFdemo (SiRF mode). 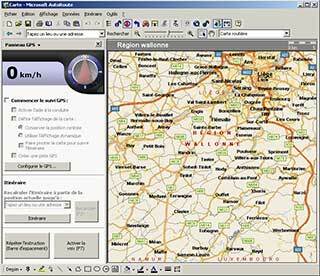 You can track your trip in real time in Microsoft Autoroute. Synchronize your PDA from atomic clock of the GPS satellites. RMC: for higher compatibility; use of internal GPS clock if no satellite fix. ZDA: a little more precise but requires satellite fix and that ZDA sentences are generated. Synchronization follows PDA regional settings. Option to resume redirection on PDA wake up if the device doesn't do it (for example on FSC Loox N500 with some firmware). Start redirection automatically by adding "/autorun" in the command line. GPS2Blue may not be bundled with other software, included on CDs etc, linked to from other web sites or made available for download elsewhere. Link to this page or to GPSPasSion instead. GPS2Blue.CAB to install directly on PDA. GPS2Blue.exe to install from computer with ActiveSync. HW VSP produced by www.HW-group.com, to create, on your PC, virtual COM ports from TCP/IP. If not already installed on your PDA, you will also need .NET Compact Framework 2.0. If you like GPS2Blue and want to support its development and author, you can make a donation. It's fast and easy. Just click on the 'PayPal' button below. How to use with TCP/IP over USB? Redirection works but there is no long/lat and LED remains grey. All other information about GPS2Blue can be found at www.gpspassion.com.